I’m not the type of person that goes gaga over desserts. I am faintly bemused by the parade of unicorn shakes, cheese drinks, bingsu and HK egg waffles that has taken over the minds of the populace by storm. I enjoy desserts, I just don’t normally seek them out. Tarte by Cheryl Koh was an exception. I made a pilgrimage after my Shisen Hanten lunch so I could check them out. Cheryl bakes all of the tart bases here personally! Cheryl Koh was awarded Asia’s Best Pastry Chef 2016 by S.Pellegrino’s 50 Best list. She’s also the resident pastry chef of 2 Michelin star Les Amis. That’s very impressive credentials and the tarts she serves has an equally impressive price tag. 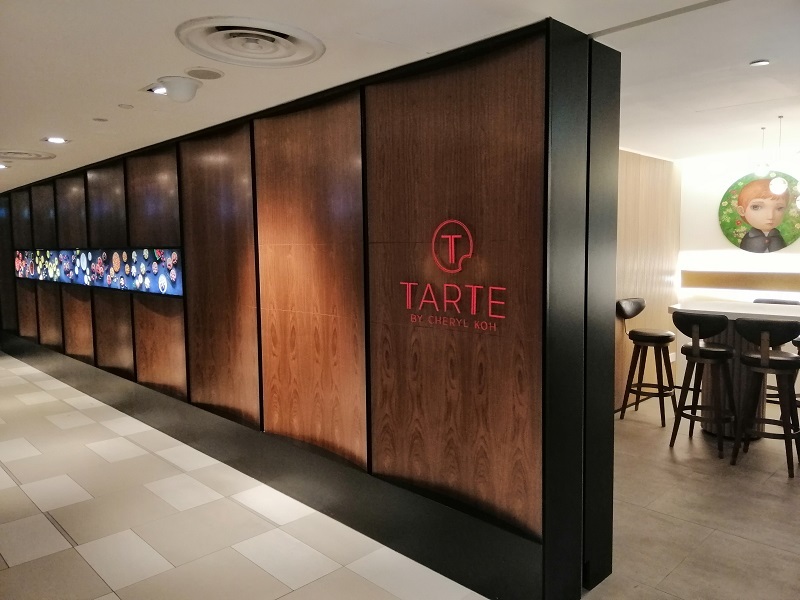 Tarte by Cheryl Koh sells each small tart for SGD 10 (SGD 11 for dine in) which is high even by Singaporean standards. Despite that, I saw a constant stream of people dropping in to takeaway some tarts. I wanted to experience the café so I ordered a latte (around SGD 8) to go with my sweet tart. 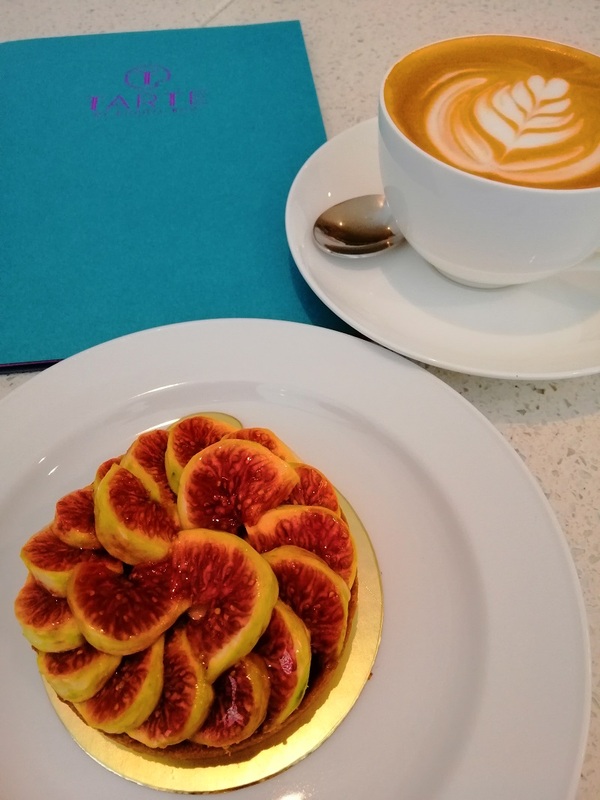 I asked the girl which tart she thinks is best and she recommended the seasonal fig tart (SGD 11). There are beautiful slices of fresh figs on top of fresh cream and a buttery, crumbly tart base. The flavors go very well together, and they’re accentuated even more by my palate-cleansing latte. Their coffee is by Gryphon Coffee (a small batch roaster) and it’s very tasty! I was also amazed by how delicious the fig tart is. It’s mildly sweet so it’s not cloying. 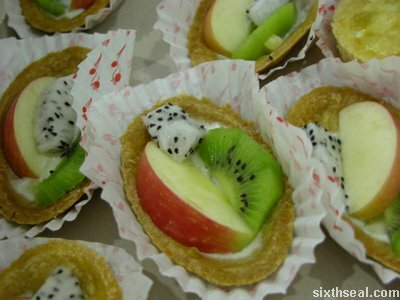 This is perfection in a tart! 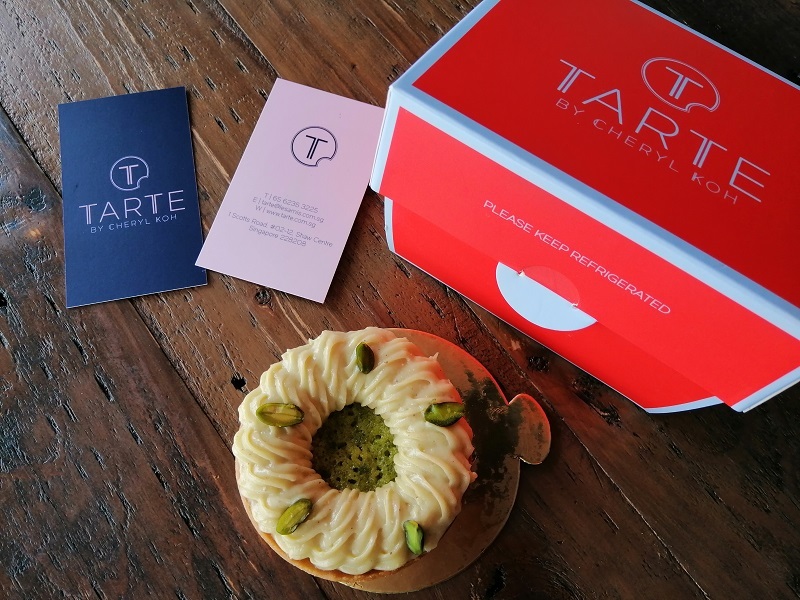 I also ordered a pistachio tart (SGD 10) to go since I like their takeaway box. There are crumbs of pistachios on top of pistachio cream and their faultless buttery tart base. Delectable! 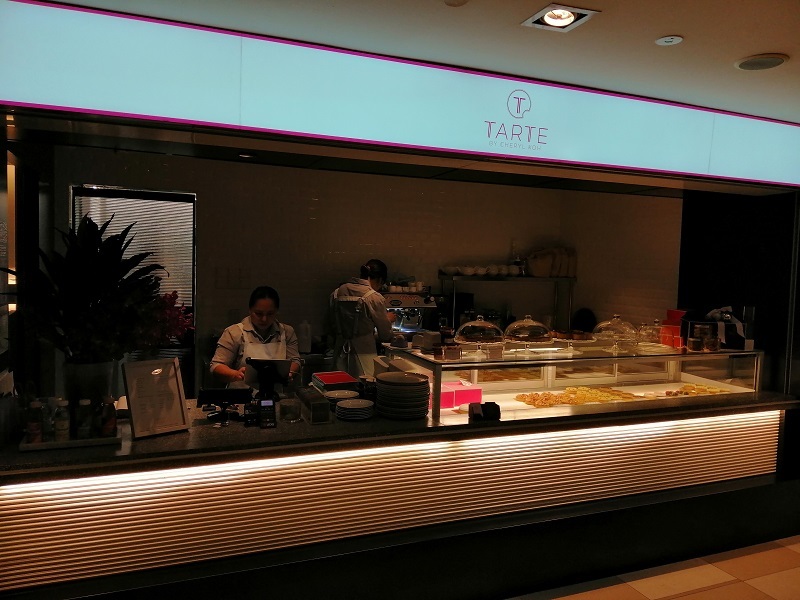 All the tarts at Tarte by Cheryl Koh are newly made. They don’t keep a lot of inventory and there’s a constant stream of freshly baked tarts appearing. It’s a little costly but well worth the money. This is the quintessential representation of a perfect tart. 11/10! 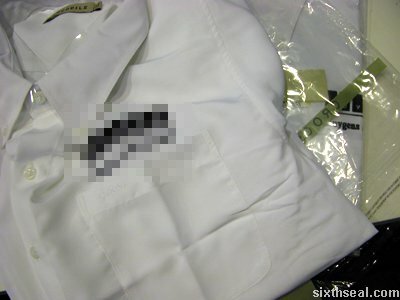 We got our company shirts (meant for the exhibition, but we wore it today for the press conference anyway) today. 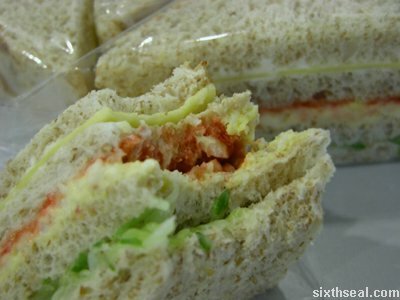 we managed to eat our fill as well. 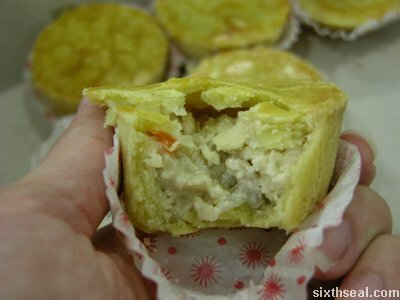 Here’s a savory pie – it has meat, peas, carrots and various things in a crumbly crust. It’s good. 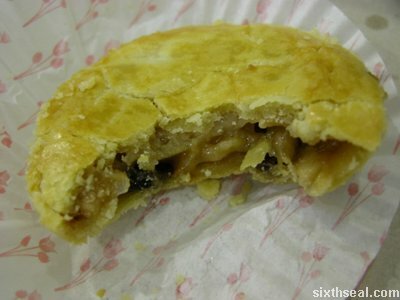 This is the sweet pie – with a mix of fruits inside. This one got sapu really fast so the photo is a lonely single pie. meat based one. It has a nice mix of colors, very appealing. Bottled water is also available, but I’m sure no one wants to see that.